I've decided to start a weekly feature that I think will be really fun! Meal Review Monday, where I review Pinterest recipe finds. You all know how much I enjoy cooking, so I'm sure it comes as no surprise that I'm always trying out new recipes I find on Pinterest. Lots of them are great, but some of them are not-so-great. There's nothing more frustrating than spending half the afternoon on "the best ever" new recipe, only to discover it's actually pretty mediocre. Have you noticed that almost every.single.recipe gets called "the best ever"? How are you ever supposed to choose which things to actually make? Hopefully my new weekly feature will help you decide if you want to try that scrumptious-looking new recipe or skip it in favor of something else. Anything to help narrow down the billions of Pinterest recipe options, right? Today I'm reviewing these Cheese and Nut Stuffed Shells. 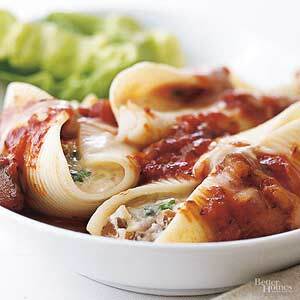 It's a vegetarian main dish; large shell pasta filled with ricotta, mozzarella, and walnuts. Image from Better Homes and Gardens. Please respect the creator and pin from the original site. I'm a semi-vegetarian, so this sounded like a great meatless main dish. I was pretty excited about it, but it was only so-so. The walnuts seemed really out of place--the crunch in the middle of the creamy ricotta was strange. Surprisingly, the dish was pretty bland overall; I felt like it was missing something. My hubby said it was missing meat, which is probably true. Some Italian sausage would go a long way in here. If you want to keep it vegetarian, I would suggest adding in some butternut squash and sage, or something else to ramp up the flavor. Final Rating: 2.5 out of 5 stars. We won't be making this again unless we drastically alter the recipe--and at that point, we're not really making this dish, so it doesn't really count. Have any of you tried this recipe? What did you think? Don't forget to come back next Monday to see my next recipe review! Looking for an Italian pasta dish that won't disappoint? Try my recipe for Cavatini--it's like a pizza casserole! Toasted pine nuts would be an excellent addition. They aren't as crunchy as the walnuts, which are sometimes substituted because of cost. A big handful of fresh Italian herbs would go a long way to kicking up the flavor, too! I can't believe it only called for a little bit of parsley. Bland indeed! Love the idea of the toasted pine nuts! The crunchiness of the walnuts was the exact problem; I may have to try it will pine nuts now. And I agree, a lot more fresh herbs would have made it so much better! I really wish my husband liked walnuts in dishes like this - because that sounds AMAZING and I would eat the heck out of it!! I thought it sounded amazing, too, but the crunch was a little too much for me. I might try it again with pine nuts as Helen suggested in her comment. When I read "the best ever" on Pinterest I get the same cautious feeling when a car salesman says "Trust me..." I like your idea of Monday reviews. I try to do about one a month and have also found many great recipes along with a few mediocre ones. I like the car salesman analogy! Some of the recipes live up to the hype, but a lot are just so-so. I do love having such a vast resource for new recipes, though! It's worth weeding through a few mediocre recipes. You never know exactly what you're gonna get when you go with a pinterest recipe! Good for you for trying something new! That is very true! I enjoy trying new recipes, and fortunately most of them have turned out well so far.